What is “personalized education”? Some teachers hear in the term nothing more than a confirmation that they are right to pay so much attention to the needs, interests and motivation of the individual pupils in their classes. Other teachers join the edupreneurs in fitting the term into a simplistic dichotomy between a bad old industrial approach to education and a bright, new, digitally enhanced education that liberates media-savvy students from the terrible constraints of the factory system, launching each of them on their private life-long learning journeys. Is that what personalised education is, though? What if, instead of discussing personalised education in the abstract and discussing what we would like it to mean, we look instead at the reality of this form of education in a country that has actually tried to personalise public education? That’s the approach taken below – looking at the UK, where personalising education became official government policy in 2004. According to the endlessly repeated narrative, personalisation is what becomes possible when the bad old factory-style school system is dismantled. In the UK at least, this is not what happened. Something did have to be dismantled before personalised learning could emerge in the UK, but it wouldn’t be fair to characterise it as a bad old factory system. The public education system that was dismantled had some interesting features that had nothing to do with an industrial model of education. Two features worth emphasising are: the autonomy of teachers and their idealism. The comprehensive system made sense as part of a broader post-war deal characterised by a willingness to solve problems by negotiation, giving more recognition to the class from which the bulk of the soldiers had been recruited during the war. However, by the 1970s some felt that the time had come to break off the deal. There were two concerns. One was that the UK was slipping too far back in the international economic league tables. In fact, in the middle of the 1970s the economy seemed to be in tatters, and in 1976 it had to be bailed out by the IMF. The other concern, felt in certain quarters, was that society was moving in the wrong direction – too far to the left, led by people who came to be referred to as the “enemy within” – an enemy that needed to be defeated. With unemployment soaring and the economy failing to compete abroad, the perception of those who came to power in 1979 was that the old consensus had to be replaced by a new system that would attract and promote business. “Business” meant private enterprise, and anything in the public sector that could be construed as a brake on private enterprise would have to be trimmed. The concerns of people like Arnold Weinstock would be addressed as part of the wider strategy to defeat the enemy within. This involved a complete restructuring of the education system. After a failed attempt to attack the comprehensive system head on in 1979 (defeated by popular opposition) the revolution in education was finally effected with the Education Reform Acts of 1986 and 1988. The autonomy of the teachers was legislated into oblivion, the negotiating rights of their union were removed, control of the curriculum shifted to the central government, the school system in the public sector was split up, setting the schools against each other (each became responsible for its own budget and that was tied to the number of pupils the school was able to attract). Along with the new National Curriculum there was to be a new national testing system so that all pupils at the four key stages of their education could know exactly where they stood in relation to national criteria. Then a new streamlined system of assessment for schools and teachers was put in place, testing schools and teachers every three years and making the findings public. The policies were sold to the public as opening up a new era of personal choice: parents would have more choice as to which school their children would attend (instead of being allocated to a school by the local education authority), and to inform this choice (and inject greater competition into the system) league tables comparing the performance of all schools were published. To further empower parents, they were given a larger say in how schools are run (school governing bodies now had to include more parents). By making each school responsible for its own budget and by forcing schools to compete against each other, they were forced to consider themselves more along the lines of businesses in a competitive market. The business model was further reinforced by organising the curriculum, the key stages and the assessment systems both for pupils and teachers as if it were a national system of quality control. Whereas the child-centred approach resisted the social divisions that were rife outside the comprehensive schools, now pupils and teachers were confronted at every turn with a hierarchy of attainment levels and were continually assessed as to their exact position in a national league table. In the wider society the dream of the government was to create a property-owning and share-owning democracy in which every citizen would have a personal stake in the growth of the economy, linking macro-economic imperatives with personal self-preservation. Education needed to prepare children for that, and it did so by replacing the prior idealism with a renewed emphasis on competitive individualism. If the message of the comprehensive system was: “If we work together we can create a better society,” now it was cut down to: “If you work hard, you might excel.” Success becomes an end in itself, and the only way to succeed is to play the game as it is. Individuality is foregrounded, but only in a way that ensures a perfect fit between personal ambition and the needs of the prevailing system. So personalised learning maintains the previous mindset of competitive individualism, with its emphasis on grades, attainment, performance, and moving higher in the league tables. And it continues to take its inspiration from business. In fact, David Miliband’s entire approach to tweaking the remnants of the public sector that his government “inherited” was supposed to be guided by the “revolution” in industry, moving away from mass production to something more flexible, allowing for a wider range of demands to be both created and satisfied by businesses who knew how to cater to the vanity of their customers and how to make the best use of more flexible forms of outsourcing to cut costs. Education must become similarly flexible and similarly tailored to the particularities of the student-customer. In other words, education must be personalised. But what exactly would this involve? Miliband highlights five elements. The first is a more sophisticated method of assessment to finely tune the setting of targets and the choice of course of study for the individual student. He calls this “assessment for learning,” and he proudly highlights the Pupil Achievement Tracker – the UK’s digital system for measuring the achievement level of each and every pupil against clear national standards. The fourth element concerns the organisation of schools, especially the flexible deployment of staff so that students across the entire ability range get extra support, when they need it, to meet their targets. “And it means a school ethos focused on student needs, with the whole school team taking time to find out the needs and interests of students; with students listened to and their voice used to drive whole school improvement; and with the leadership team providing a clear focus for the progress and achievement of every child.” It’s nice the way that sentence begins with something that sounds radically democratic, and ends by insisting that the “leadership team” will keep everyone focused on individual progress and achievement. “Acceleration,” “clear focus,” “progress,” “standards,” “achievement,” “excellence” – there is no post-industrial idealism here – no vision of a better world which all this hard work, target setting and achievement might bring into being; rather, there is only the ultra-industrial idealism of a more streamlined world in which the treadmill spins faultlessly and the individual, personally trained to maximise her contribution to the spin, can find online at any moment of the day or night the precise speed with which the treadmill is turning. 1 From a theoretical point of view there are two objections: Firstly, there is something lacking in a theory of personalisation that pays little or no attention to the informal education provided in abundance outside schools and the ways in which it depersonalises (or substitutes an ersatz notion of the personal for a deeper sense of the self); secondly, and more damningly, there is the lack of a persuasive theory of education behind the drive to personalise. Where is the elaborate theoretical elucidation of the need to replace the theory of child-centred education with that of personalised education? The analogy drawn with the companies that are now “personalising” their products begs the question of its relevance – a question that needs a decent theory to answer it. Where is it? 4 Personalised education actually militates against the personal. Rather than deepening the interior life of the individual, it keeps the student’s attention focused on the externalities of grading and achievement. 5 It is undemocratic. A healthy democracy needs a lively civil society (the latter being made up of elements that are directly controlled neither by government nor business). The teaching community in the UK was once an important pillar of civil society. With the end of teacher autonomy and the attempt to trim schooling to the needs of business, that ended. 6 Isn’t there a threat to the idea of the teacher as a person with a sense of vocation? Doesn’t the sense of vocation imply a greater purpose – a vision of a better world? When a teacher’s job is reduced to achieving goals in a system where all idealism has been weeded out, have the grounds for a sense of vocation not been destroyed? 7 Bernard Mandeville’s The Fable of the Bees (1714) argued that the best societies are those driven primarily by ambition, greed and envy. Comprehensive education in the UK could have been part of a concerted effort to prove Mandeville wrong. The changes since 1979, by contrast, are unashamedly pro-Mandeville. Personalised education remains within the same hive mindset, and the business of personalising makes it more likely that the soulless spirit of the hive will work its way into the bloodstream of the individual. 4 Quoted in: S J J Ball, Politics and Policy Making in Education, Routledge, 2012, p73. 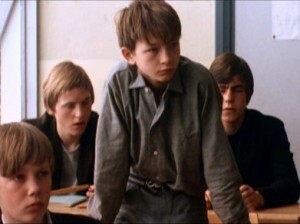 Ken Loach presented an interesting view of UK public education in the film Kes. The following clip shows what UK dogme looked like in 1969. Thanks for debunking the notion of personalised education so eloquently. What is sad is there really seems to be no light visible from this part of the tunnel – radical structural change to the education system isn’t really on anyone’s agenda.